This post is the finale of a series that began here. I’m just going to go ahead and say it: save meeting the Queen, The Elders event was a pretty tough act for any other event to follow. But somehow, the British Council put together a very engaging and rewarding schedule for the final days of the Future Leaders Connect program. 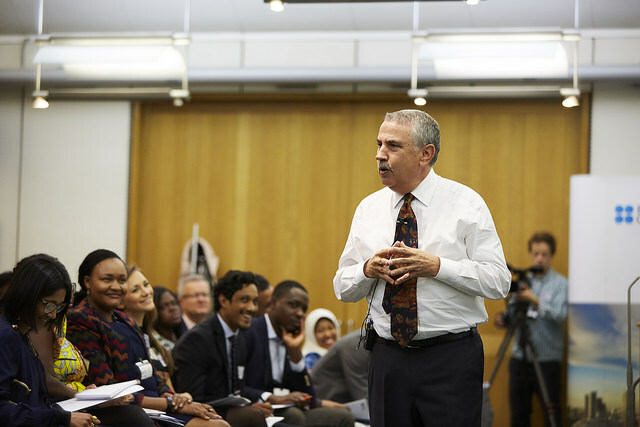 Over two days, UK Parliament hosted an immersive conference for the Future Leaders Connect group titled: Fast Forward: Preparing For The World Ahead Of Us. During plenary sessions, we learned from people like: Rt. Hon. the Baroness Prashar CBE (Independent member of the House of the Lords), Dr. Thomas Hale (Associate Professor in Public Policy, Oxford University) and Elizabeth Linder (she built Facebook’s Politics and Government division for the EMEA region). L-R: Dr. Thomas Hale, Elizabeth Linder, Rt. Hon. the Baroness Prashar CBE and Sir Ciarán Devane (Chief Executive, British Council). Hands down, my favorite plenary session was the keynote speech by Thomas L. Friedman. Friedman is a New York Times Columnist, three time Pulitzer Prize winner, and author of the best-selling book The World Is Flat. In Nigerian-speak, ‘The man’s brain dey hot!’ There was pin-drop silence in the room from start to finish of his presentation. Thomas Friedman giving his keynote speech. Friedman spoke about how technological accelerations are changing politics, geopolitics, ethics, community and the workplace. He also answered questions like: How do you write a good column? Is God in cyberspace? What does a disappearing digital divide in the global north mean for the global south? Between plenary sessions, our group of 50 was split into three thematic groups: 1) The Robots are Coming: Technology’s Role in Economic and Social Change, 2) Migration, the Nation, Global Collaboration: Globalization, and 3) A World Fit to Live In: Climate Change and the Environment. I was assigned to the Migration group which I was very excited about as I have worked on human trafficking and smuggling of migrant policy issues in the past; as well as in an immigration law firm. #Usie with the Migration group. Each group had working sessions with various MPs. During my group’s first session, we defined migration policy priorities with Robert Jenrick MP (he was recently elected with the highest vote share that a conservative has ever won). We then worked with Lord Steward Wood MP (a Labour member of the House of Lords and former senior special advisor to Gordon Brown) and Sir Vince Cable MP (leader of the Liberal Democrats party), who helped us formulate policy solutions to the priorities we identified. During lunch and coffee breaks, we were introduced to other MPs based on our country affiliations and policy interest areas. I particularly enjoyed meeting Kate Osamor. Osamor is a Nigerian-British Labour MP, and also serves as Shadow secretary of State for International Development. Prior to being a shadow secretary, Osamor was Junior Shadow Minister for Women and Equalities. Women like Kate Osamor remind me to keep pushing the boundaries of possibility in my life. #TeamNaija with Kate Osamor MP. Following a long first day of policy debating, we attended an evening reception hosted for us at the Residence of the Speaker of the House of Commons, John Bercow. 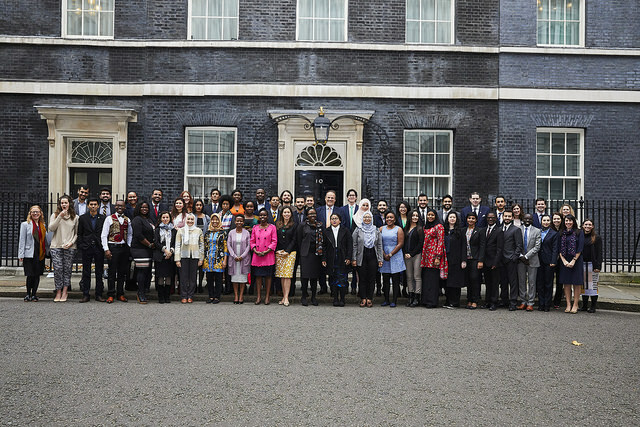 After presenting our policy solutions in plenary at UK Parliament, the FLC group visited No.10 Downing Street, where each thematic sub-group presented its policy solutions to Mark Field MP (Minister of State for the Foreign and Commonwealth Office). The FLC Group with Minister Mark Field. At the BBC, the FLC group probed the intersection of media and public policy. Francesca Unsworth (Director, BBC World Service Group) gave an overview of how the BBC is responding to a fast-changing world. An interesting fact from her presentation: one-third of the BBC’s audience is in Sub-Saharan Africa. Unsworth also discussed the process of setting up the BBC’s new (and so far, very successful) pidgin service. Mary Hockaday (Controller, BBC World Service English), shared tips for reaching new audiences. Dmitry Shishkin (Digital Development Editor, BBC World Service) gave a very interesting presentation titled: ‘5 Lessons I Learned While Digitally Changing BBC World Service.’ Lesson 1: Content is Queen. One of the reasons why content is queen? Women. While transforming BBC’s digital department, Shiskin gleaned from analytics that articles catering to women performed very well across all sub-categories. Yet, such articles were not being published nearly enough—so he changed that. Repeat after me: The future is female. If you’ve been following my blog long enough, you probably know I am obsessed with Christian theology, and how religions in general shape both private thoughts and public policies. Thus, visiting Lambeth Palace, the London residence of the Archbishop of Canterbury was one of my favorite parts of this trip. I was in my element. During the session led by Sarah Snyder at Lambeth Palace, I felt absolutely and positively alive. Sarah Snyder is the Archbishop of Cantebury’s Advisor for Reconciliation. She is a theologian who specializes in Jewish-Christian-Muslim relations, and has wide-ranging international experience promoting faith-based dialogue, peace, and reconciliation in conflict and post-conflict zones. She has worked with organizations like the United Nations. Snyder’s session dealt with issues like: What are strategic peacebuilding paths? How do we develop shared histories in diverse and fractured societies? Through her session, I gained several concrete tools for my policy and writing workboxes. The final item on the FLC London agenda was visits to various think-tanks. We were split into different groups, and I joined a group that visited the Legathum Institute. The Legathum Institute is an international think tank focused on creating pathways from poverty to prosperity. Let me tell you: their Mayfair office looks, smells and feels like prosperity. I have never in my life been in an office so nice—even the toilet bowls had art and inscriptions! At Legathum, we learned from the institute’s Senior Fellow, Matthew Elliot. Elliot is a Senior Fellow at the Legathum Institute. Having been Chief Executive of Vote Leave, the official Brexit campaign in the 2016 EU referendum, Elliot is now one of the UK’s foremost political campaigners. 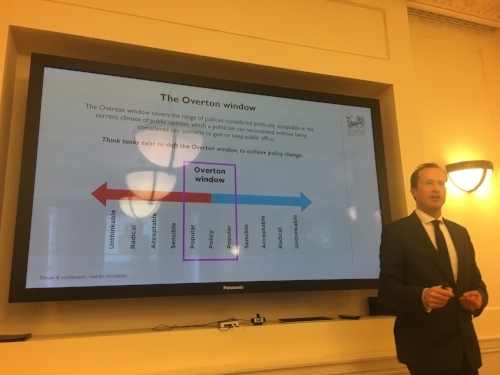 He has been described by the Financial Times as “one of the most formidable political strategists in Westminster.” Elliot taught my group how to influence what voters and decision-makers are thinking. The FLC group bonded rather quickly, so saying goodbye was tough. We had a farewell dinner at the British Council’s headquarters, where there were lots of speeches, hugs and even some tears. I will not say I participated in the tears, but I will say my eye allergies were acting up and my eyes got a little watery.